We have added an informational section for our Support team that provides information on catalog updates for specific vendors. If you have questions about specific updates for a vendor to the system catalog, please contact our Support team. They will be able to provide information on update frequency, most recent update to a specific vendor, and which manufacturers are currently in the catalog. Please do not contact the vendor: all catalog updates are done on the Rain end. This update does not list specific items, so if you are wondering why an item from a vendor is not showing up in the catalog, it will either be because it is no longer in the vendor's active list of products, or because it has not yet been added by our Catalog team. 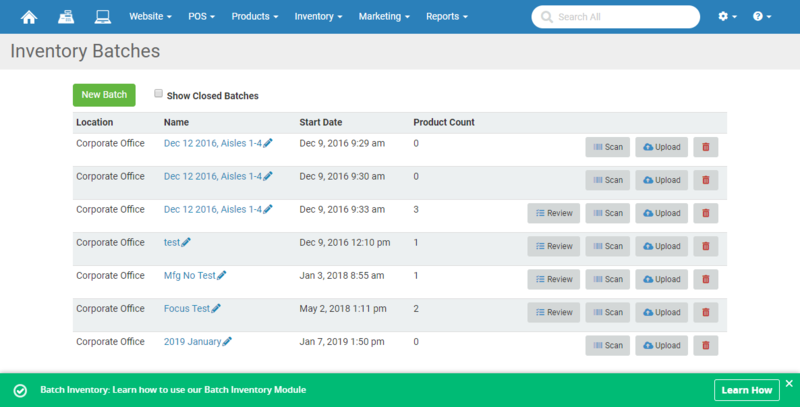 Added a WalkMe tutorial link on the batch inventory page of the system (Inventory > Batch Inventory) to guide clients to the Batch Inventory Article. We pushed out an additional fix that should resolve the rest of the IPN issues, but it requires a change to be made to your PayPal account. In order to fix this you will need to change the IPN URL you are using to the following format "www.mywebsite.com/checkout/ipn.php". Once this is changed, you should no longer receive IPN emails about not being setup properly. If you are not familiar with where to find the IPN section of your PayPal account, this article has information for you. If you have any questions about this, please contact our Support team. Fixed an issue where clicking the "Add Additional Session" button would force the user to the top of the page. Fixed an issue where an apostrophe in the search text was causing an infinite loading screen and the search wouldn't progress. Fixed an issue where the website shopping cart wasn't loading in Internet Explorer 11, so all that could be seen was a blank page. Please note that earlier versions of Internet Explorer are no longer supported by Microsoft, so if any customers contact you having trouble with an older version, please instruct them to upgrade to the latest version, the older versions are not safe to use. Fixed an issue where setting product reward or discount eligibility through Bulk Edit didn't work properly. Fixed an issue where classes in a status other than "active" were still appearing on the calendar.